I’ve had my Silhouette Portrait for about a week. And, I’ve used it every single day! After practically getting a hand cramp from cutting out E’s birthday banner almost two years ago, I knew I couldn’t do it again! I was sent a Silhouette and some accessories in exchange for posting my thoughts. However, the Portrait was already on my wish list and I’ve already scooped up accessories on my own. If you aren’t familiar with the Silhouette, you plug it into your computer via USB. 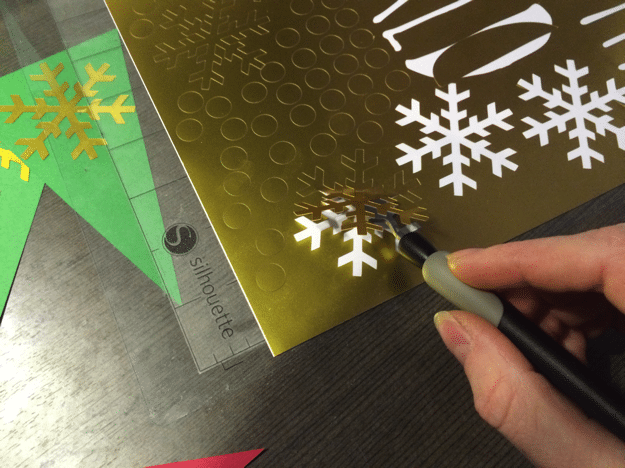 But instead of printing with ink, it prints by cutting paper, vinyl, foil, card board and even felt. I’m only experimented with paper and foil paper at this point, but I’m thrilled with what I was able to do in less than 30 minutes, including creating the template! 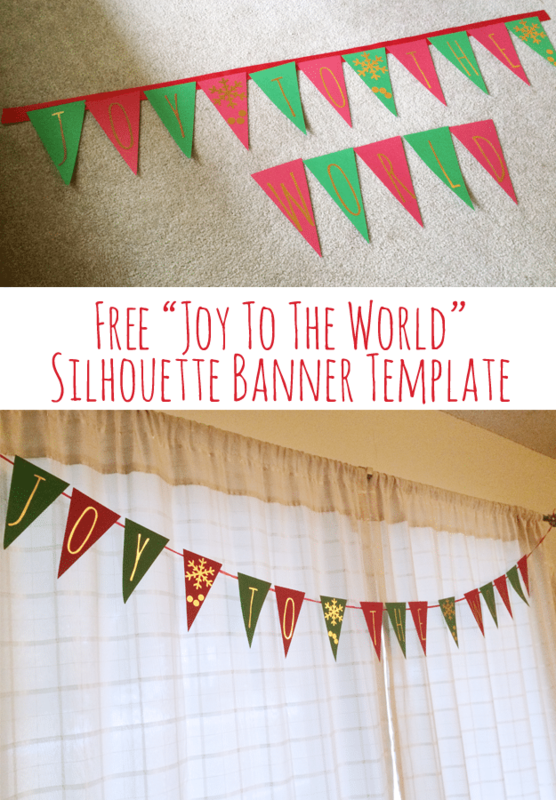 This “Joy to the World” banner was only my third project! After the first project, I quickly realized I needed to have the spatula. It makes removing the cut outs like a million times easier. I very quickly and easily created a page that would be my triangles for the banner. I printed the triangles on some card stock I had from my scrapbooking days. Then created another page with the words that I wanted (using Google Font Amatic) and some snowflakes and circles to use for the “space” banners. Grab the free banner template page (I did one page of red and one of green and it was exactly the right amount). 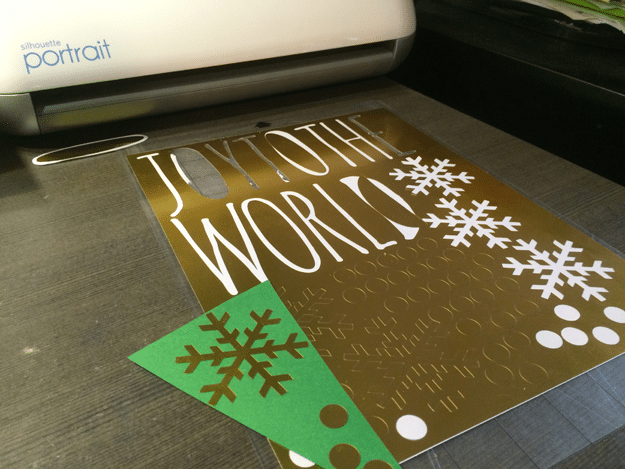 Then, download the free “Joy to the World” and snowflakes cut file if you like those. Of course, you could do your own words on the banner, or use the words on something else. The gold is actually a printable gold foil with an adhesive back so I was able to quickly peel it from the page and place it on the triangle cut outs. 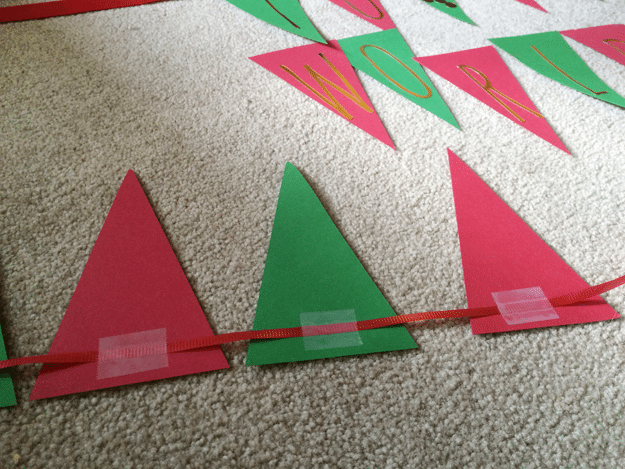 I placed them on the floor to see how long I needed my ribbon to be and taped them onto the ribbon on the back. I later saw an awesome tutorial where people actually used a sewing machine to stitch them together. Maybe I need a sewing machine? 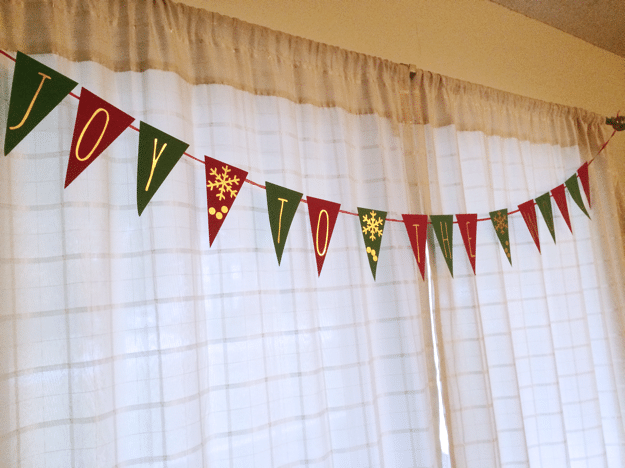 Without any careful planning or measurements, the banner works perfectly across our windows in our living room. You could always put it on two strings or vary the placements to make it even more your own. This came out great I love it! Super cute! I love how FAST you can do projects and how precise the cuttings are! So super jealous… I have wanted one of these for some time now. I have a Cricut- I hate it. I can’t even get it to work anymore. The Sillouette came out days after I bought my Cricut… I need to sell it online and get a Sillouette. Bummed I missed this deal!